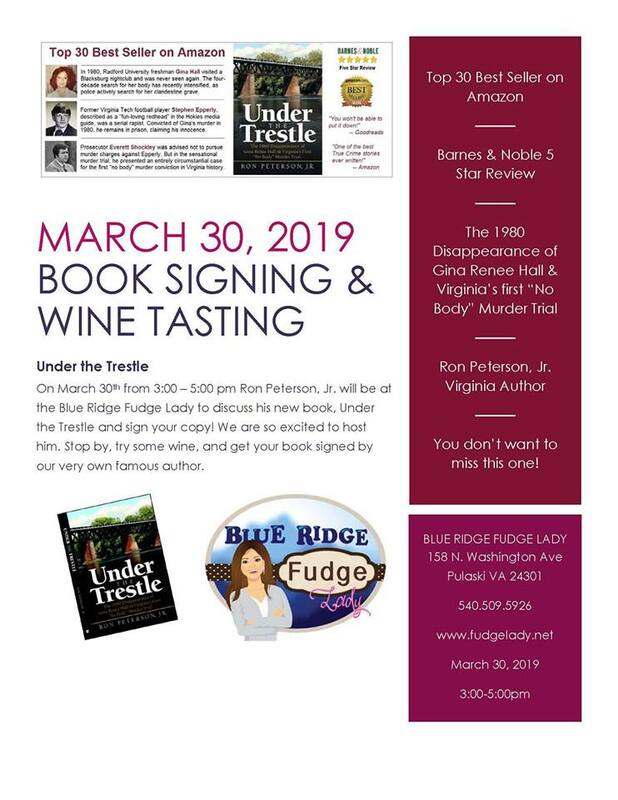 The Blue Ridge Fudge Lady presents a Book Signing with Author Ron Peterson, Jr. & Wine Tasting on Saturday, March 30, 2019. Author Ron Peterson, Jr. will discuss his new book "Under the Trestle" and sign copies. Stop by, try some wine and get your book signed by our very own famous author. "Under the Trestle" covers the story of the 1980 disappearance of Gina Renee Hall and Virginia's first "no body" murder trial and the four-decade search for Gina's remains. The book is currently a top 30 Best Seller on Amazon. For more information on the book, visit: https://www.underthetrestle.com/. NOTE: The time for the event was moved from 3:00-5:00 pm to 5:00-7:00 pm. To view the event flyer, visit: https://i.imgur.com/lB7pqUy.jpg. For more information, visit: http://fudgelady.net or https://www.facebook.com/fudgelady.net or call 540-509-5926.